I've been brewing kombucha for a while now. 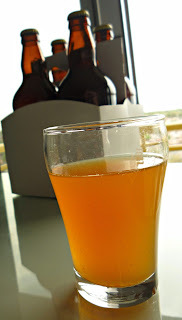 The plain kombucha is nice but I really enjoy experimenting with the concept and basic tenants of kombucha brewing. I followed the basic recipe found here to brew up some kombucha wine. The wine has been fermented since 3 March 2013 and I bottled it up on 23 May 2013. A one gallon carboy made 4 500 mL bottles of wine (seen in the background here). I cannot decide if it's better to further age this in the refrigerator or at room temperature but it is currently at room temperature. It's now a recommended three month wait to taste this wine. I might break a bottle out for my upcoming Kombucha Workshop. I have a good feeling about the final product because, at bottling, the kombucha wine was flat and slightly sour but a rich orange colour with citrus notes. I am counting this batch towards my goal of 24 1 gallon batches of homebrew in 2013. Click here for my other kombucha adventures.